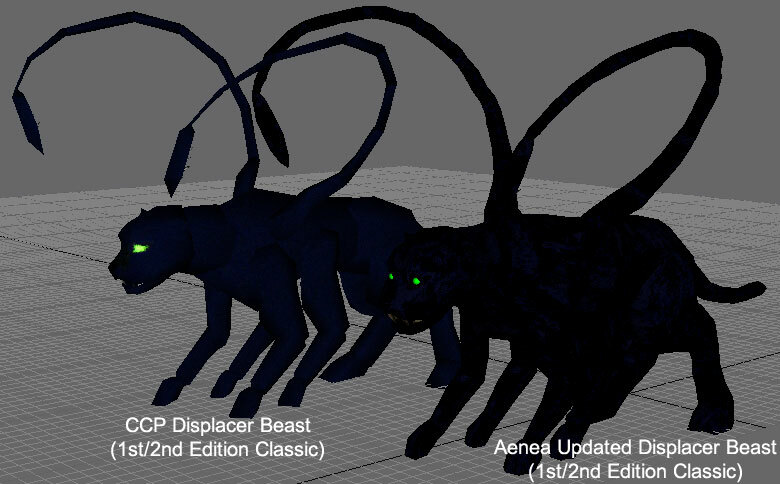 I've been dissatisfied with the CCP's displacer beast for some time, and I've never like the 3rd Edition version created later. Late last night, I started on a project to revamp the aging beast with a new texture, a new flexible skinmesh, thicker tentacles, and glowing green eyes. Ran into an issue when I thought I was about finished. Waiting and hoping for an answer from the other custom content folks over at the BioWare forum, but if it get's answered soon, this will be in the next hak update. Here's a work in progress pic. It uses the lion texture for now, since the new one for the displacer beast is even darker than the old one, and lighter textures are much easier to work with in gmax. Looks terrific to me! Great job! P.S. Name this one 'Sandy-Claws'!!! 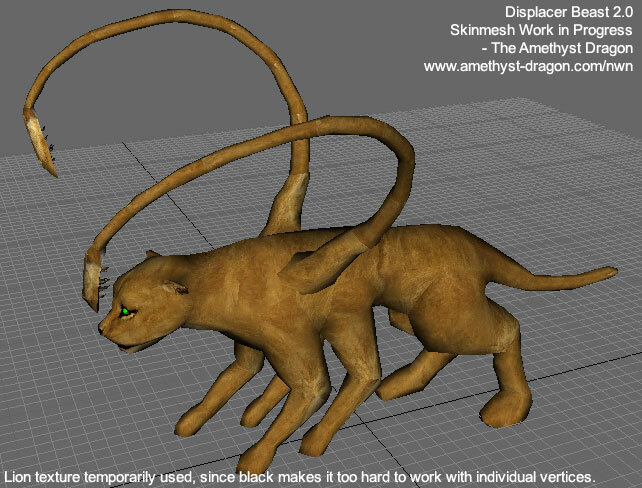 Updated displacer beast model now in-game if you've got the latest updated hak. From a distance, the most obvious difference will be the glowing green eyes. A bit closer and you'll notice the new texture (it's almost all black, with dark blue highlights, rather then the old uniform dark blue). Close up and better light will show off a smoother model with the skinmesh. It wasn't the most glaringly chunky model in the game, but the chunkiness, the spindly tentacles, and the non-black texture had been bothering me since the moment I first thought of editing the model to add glowing eyes. Funny enough, I'm actually building a few extra little areas for Aenea's Underdark today.